mistake: an error in action, calculation, opinion, or judgment caused by poor reasoning, carelessness, insufficient knowledge, etc. I particularly like that part about insufficient knowledge because it doesn’t mean that smart people don’t make mistakes. Even smart people are smart in certain areas and not so much in others. For example, Albert Einstein, pretty smart… in theories and mathematical equations. Put him on the street in Harlem and see how many mistakes he makes. See what kind of trouble he gets into because he doesn’t understand the lingo, the nature of the streets. Some of my mistakes have fit into this paradigm very nicely and neatly, like the time I got on the wrong subway in Boston. I know the subway like the back of my hand, but the subway I’m familiar with is the Philly one, and Boston’s is just different enough, and the area just different enough, that I got lost for a good hour before finding my stop. Another time I made the mistake of asking a woman when she was due, and… she wasn’t pregnant. I call it foot-in-mouth disease, but that’s another mistake I created because I didn’t know. Other mistakes I’ve made weren’t as easily identifiable at the time, but they came back to hurt me nevertheless, like in high school when I was careless about where I placed my clothes during gym class. I didn’t know that this groups of boys would gather up any clothes left out on the benches and throw them out. It was my mistake, and my penalty for it was having to go home in my gym shorts and t-shirt, carrying my smelly clothes home in a garbage bag. While these mistakes were all preventable they did serve major purposes in my life. They helped me learn. Now, I don’t think that the only way we learn is through making mistakes, but they can be imminently helpful. I learned that when I don’t know if a woman is pregnant or not I should just keep my mouth shut unless she brings up an impending birth. I learned that if I’m in a city I’m unfamiliar with I should ask the attendant at the subway station ticket booth where I need to get off to reach my destination. And I learned that I needed to put my clothes securely in my locker or I would be walking home in freezing weather in only a pair of short shorts and a flimsy t-shirt. 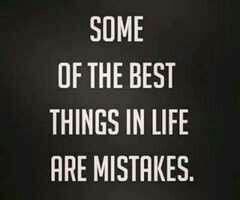 I never made those mistakes again, but I have made a host of other mistakes since then, and that’s okay because I’ve learned something from most of them as well. But my favorite mistake is when I underestimate someone and they shock the pants off me, proving me wrong in the process, because no matter how perceptive I think I am, there are just some things about people that I can’t judge based on initial appearances, and that’s a good thing. That people can still surprise me is a gift, and I’m never so happy to be wrong as when I make that particular mistake. Maybe at some point I’ll simply stop underestimating people, but then I’ll miss those surprises. Thank you very much. Mistakes, I’ve made a few. I say if you can’t learn from your mistakes what’s the point? Appreciate the comment.